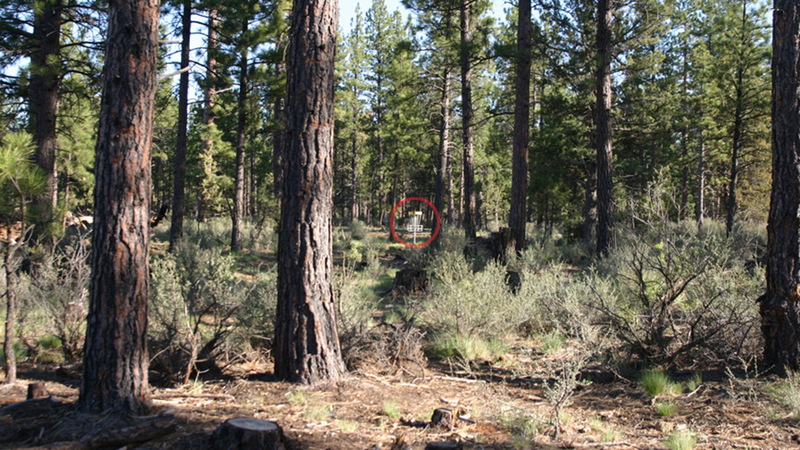 Maintained by Sisters Parks and Rec and built in 2006, Hyzer Pines is the only permanent, year-round disc golf course in Central Oregon. Hyzer Pines is a unique compliment to the Oregon Disc Golf scene, featuring 18 holes, Launch Pads rubber tee pads, Innova Discatcher baskets and an elevation of 3,100 ft, making disc stability clearly more pronounced than at sea level. Located on Sisters High School property off McKinney Butte Rd, the course, which is 5,185 feet long (to 6,160 ft), weaves through ponderosa pine forest and sagebrush over the relatively flat terrain with one water hazard. With a B+ rating on Disc Golf Scene, it’s a challenging course appropriate for medium to advanced players, with long holes and trees, plus occasional winds. Holes have three baskets to provide variety, and some holes have more than one tee, so the course can be played many ways. Due to its location on school property, there is no smoking or drinking allowed on the course, so plan accordingly.